Victorian Roller Derby League, of Melbourne, became the first-ever Australian team to qualify for WFTDA Championships and placed second in the Charleston Playoffs. Joining VRDL in Nashville will be the Rose City Rollers, of Portland, Oregon, USA who won the Charleston Playoffs, and the Philly Roller Girls who finished 3rd after a hard-fought win over the Atlanta Rollergirls, of Atlanta, Georgia, USA. Read the complete tournament results. Relive all the amazing D1 Playoffs action in the WFTDA.tv Archives! 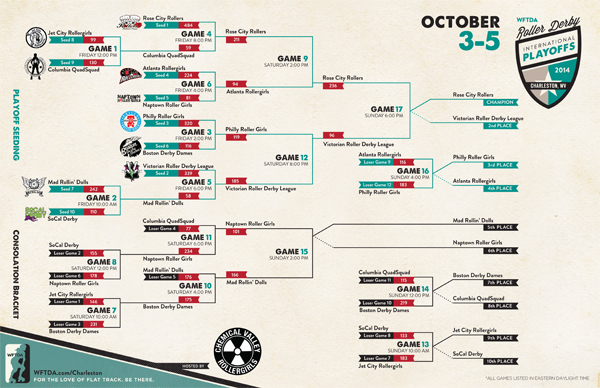 Free archives of all 2014 WFTDA Playoffs and Championships will be available at WFTDA.tv.